The new salary charts are available below. They include the side letter salary increases. The 2017-2020 agreement between the Court Administrator of the Trial Court of the Commonwealth of Massachusetts and the National Association of Government Employees in now available. Please use the link below to access the full text document. On Thursday, February 28, 2019 the Group Insurance Commission (GIC) released the expected plan premium increases for FY20. The average increase across all FY20 health insurance plans is 3.6%. Unfortunately, the premium increases are set by the insurance companies and historically there has been little recourse for the GIC, in part due to the state procurement law. As part of our ongoing legislative advocacy efforts, NAGE filed legislation this year (Senate Bill 583) to exempt the GIC bidding process from the procurement law in order to foster greater competition in the bidding process. Increasing Labors Voice (House Bill 2179, Representative Peter Capano) – adding two labor commissioners in seats currently held by members of the general public. Cost shift containment (Senate Bill 584, Senator Paul Feeney) – advocating for statutory caps on out-of-pocket costs at $2,500 for an individual and $5,000 for a family, in addition to earmarking surplus GIC funds to be transferred into the GIC trust fund to be used to pay cap overages. Procurement (Senate Bill 583, Senator Paul Feeney) – We have consistently heard from GIC administrators that one of the main reasons for the lack of bargaining clout with insurance companies is the state procurement process. We are calling for a change in the state’s procurement law to allow for greater competition in the bidding process for greater cost containment year to year. “We will continue to fight to level the playing field at the GIC,” stated NAGE National President David J. Holway. “One of our biggest concerns is protecting our members health insurance, and we will continue to combat the rising costs. Please check back for updates and information on how you can help move our GIC legislative agenda forward. Trial Court and Union agree on perpetual Comp Time pay-down policy and pay upgrades for hundreds of members! Over the last several months, the Union has been meeting regularly with the Trial Court in an attempt to solve several key issues affecting our members. One, a Comp Time pay-down policy that is perpetual and pays our members for Comp Time earned within a reasonable period of time. Please see the attached Memo for the details on our groundbreaking agreement. Additionally, in the attached Memo you will find that the Union has successfully negotiated policies resulting in significant pay upgrades for hundreds of our members! I would like to thank the Executive Board Members of Locals 458, 229 and 118 for their tireless work over the last several months. Their dedication to the members they serve has resulted in this significant outcome! If you have any questions, please feel free to reach out to your Local President Kim Gruenberg at 617-984-4157, or Trial Court Director David Bernard. The results from the election of Vice President of Assistant Chief Probation Officer are in! Congratulations to Ann MacDonald on being elected to the seat. Yesterday afternoon, October 23rd, the Governor officially signed the bill to authorize funding for the MA Trial Court contracts. The 2017-2018 raises will be reflected in your paycheck dated November 16, 2018. The retro pay will be in your paychecks dated November 30, 2018. Late yesterday, the Massachusetts House and Senate passed the supplemental budget funding bill, which contains the authorization to fund the State (Units 1, 3, 6 not MassDOT) and the Trial Court contracts. The Governor has 10 days to sign the bill, but we expect that he will act quickly. Once the Governor signs, the HRD will send out an implementation memorandum to all agencies to implement the pay raises. We estimate that this will take two pay periods before you will see the prospective raise in your check, and potentially three pay periods before the retroactive raises hit. For Trial Court, the raises agreed upon in the Collective Bargaining Agreement contained in this funding bill are 1% + 1% retroactive to the first pay period of July 2017, and 2% retroactive to the first pay period of July 2018. We will update you as soon as possible with further news. Nominations closed on Monday, October 1st at close of business. The following positions on the Local 118 Executive Board only received one nomination, and no election is required. The following position recieved more than one nomination and will require an election. Ballots will be mailed on or about October 15, 2018 and must be returned by mail to NAGE no later than November 19, 2018. Ballots will be counted at NAGE headquarters at 9:00AM on November 19, 2018. Nominations of candidates for election as officer for NAGE Local 118 are now open. Nominations for candidates, with the signed acceptance by the candidate, must be received at NAGE on or before October 1, 2018. We have received many questions about the state of your contract, and what is coming next. The supplemental budget that contains the funding for the Units 1,3 and 6 Executive Branch employees, as well as Trial Court employees, is still pending in the legislature. The legislature continues to meet in informal sessions, and it is likely the budget will be voted on and passed sometime this fall. Then the money will be appropriated for the raises, retroactive to their effective dates. Because the financial trigger was met, you will be receiving an additional 1%. This will give Trial Court employees a compounded 1% + 1% raise, retroactive to the first pay period of July 2017. You will then receive an additional retroactive 2% across the board increase, retroactive to the first pay period of July 2018, and a 2% increase the first pay period of July 2019. NAGE continues to lobby for quick passing of the supplemental budgets so we can get your raises to you as soon as possible. As soon as any concrete information comes out of the legislature, we will notify you. As stated in previous communication, the Union and Trial Court are pleased to announce a partial Comp Time Pay Down. We expect the pay to be in your check dated July 27, 2018, but no later than the check dated August 10, 2018. The percentage pay down will be approximately 33% of all hours in excess of 75. The Union will continue to work on a long range, permanent, and perpetual solution to Comp Time accumulation and pay down. We are optimistic that we will have an announcement coming to you shortly. On Friday, June 8, 2018, NAGE members of the Trial Court voted to ratify the tentative agreement that was reached with the Trial Court on May 15th. "While this contract is not all we had hoped to offer our members, we are pleased members chose to move forward with ratification," said Trial Court Local 229 President Margaret Thompson. We still feel that it is a realistic possibility, though NOT guaranteed, that the trigger will be hit. We will reach out as soon as possible about the funding of the contract. Thank you to all who participated in this ratification, and to those who worked hard to build this contract. Ballots were mailed out on Friday, May 25, 2018. If you have not received a ballot in the mail by Thursday, May 31, 2018, please contact Kelly Alexander to request a duplicate at kalexander@nage.org or 617-376-7205. The following letter, MOA and Section 17.08 will be mailed in hard copy to all Trial Court members on Monday, May 21, 2018. Update: House Bill 1377 (Group 4) has been referred to the House Ways and Means Committee. We need the help of NAGE members to encourage their Representatives to support this bill! Please take a few moments to call your Representative, and ask that they support House Bill 1377. Please ask your Representative to call the House Ways and Means Chair Jeffrey Sanchez, and urge him to release the bill favorably from House Ways and Means as soon as possible, so we can pass this critically important and long overdue legislation. We expect that the bill will now advance to the House Ways and Means Committee. Please check back for updates on HB 1377 and to learn how you can lend your voice to this important legislation. The Group Insurance Commission (GIC) met on Tuesday, February 6th and the outcome of the meeting was very positive. The GIC is taking the concerns of our members and other stakeholders very seriously in their considerations for the GIC Health Plans. Our labor comissioners Bobbi Kaplan, Margaret Thompson and Joe Gentile have provided tireless advocacy on behalf of our members, and the healthcare we all depend on. NAGE would also like to acknowledge YOU! The calls that members made to their state representaives and senators were incredibly important and caused the GIC to push through the reconsideration vote. The six (6) carriers will offer a total of eleven (11) plans. Co-pays are now standardized across all carriers and all plans. There is no change in deductibles, except for the limited network plans. The deductibles for Unicare CC, HNE HMO, HPHC Primary Choice, Tufts Spirit and Fallon Direct (limited network plans) have been reduced to $400 for individuals and $800 for families. The deductables for NHP Prime will be remaining at $500 for individuals and $1000 for families. Co-pays for Tier III specialists in all plans have been reduced from $90 to $75. The out-of-pocket maximums for all plans will be $5,000 for individuals and $10,000 for families. Unicare's out-of-pocket maximums have been changed to these amounts to reflect consistency across all plans. The GIC will be voting on rates February 22nd. Our labor comissioners will be present at the vote on the 22nd to ensure affordable health insurance rates for our members. We will keep you updated following the meeting on the 22nd. The 2018 GIC Health Fair schedule is posted below. Please note that there will be thirteen fairs held across the commonwealth at multiple locations and different times to accommodate as many members schedules as possible. If you cannot load the graphic, please click HERE. 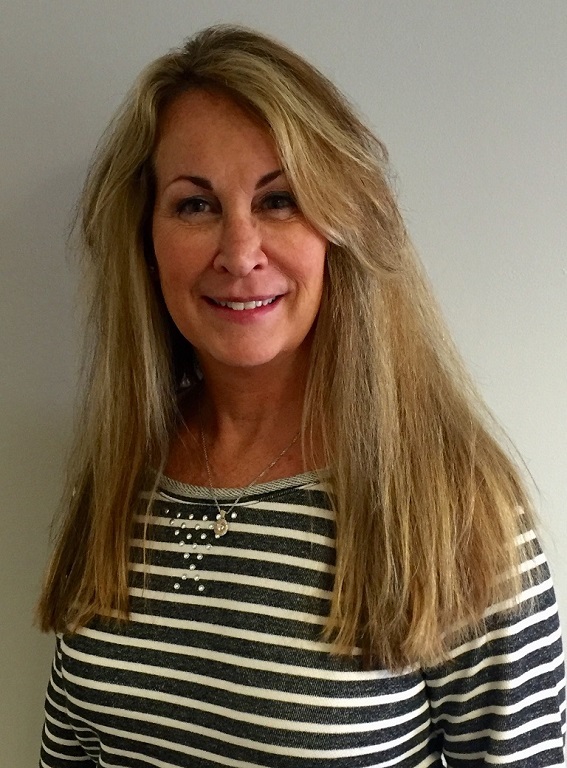 The National Association of Government Employees (NAGE) is endorsing Theresa McGoldrick for the State Retirement Board. 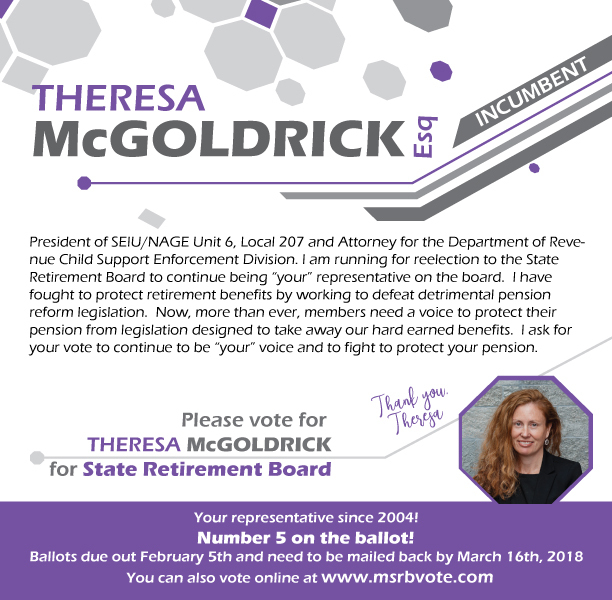 Please vote for Theresa McGoldrick, "your" voice on the State Retirement Board! Theresa McGoldrick is a National Executive Vice President of NAGE and President of Unit 6 /Local 207. McGoldrick is running for one of the two elected positions on the five-member board. The elected member will serve a three-year, uncompensated term which begins May 2018. ​Ballots will be sent out on Monday, February 5, 2018. Ballots may be submitted via mail, telephone or electronic submission. Each eligible member is only able to submit one vote. Votes must be received in the manner and format specified in the ballot on or before March 16, 2018. Earlier today, the GIC voted to reverse their decision of January 18th and will continue to offer Fallon, Tufts and Harvard Pilgrim health plans to NAGE members and other commercial subscribers! These options will be available alongside Unicare, Health New England and Neighborhood Health Plan. NAGE representatives attended the GIC meeting to hear the discussion before and after the vote. The commission first moved to vote on reconsidering their previous decision to eliminate Tufts, Fallon and Harvard Pilgrim as healthcare options for GIC subscribers. The vote was passed with 12 in favor and 2 against. The outrage from Union Leaders and members alike led to the reconsideration of the GIC's decision. At the public hearings after the GIC's decision was announced, members turned out by the hundreds to express their anger and fear. One of the most prevalent statements that was taken to heart by the GIC was that many with preexisting conditions were afraid that they would lose their doctors with whom they have built relationships. President Holway sent a public letter to GIC Executive Director Roberta Herman filled with words that hit close to home for so many across the Commonwealth (letter can be found HERE). President Holway's sentiments were further expressed at the GIC Oversight Hearing, where he was invited to share the concerns of NAGE members with the Senate. Testimony footage can be found HERE. The commissioners were asked to vote on replacing Plan A - the reduced carrier plan that was voted through on the 18th, with Plan B, which included the options of Tufts, Fallon and Harvard Pilgrim for commercial subscribers. Plan B was voted through, allowing commercial subscribers to the GIC the options of Tufts, Fallon and Harvard Pilgrim along with Unicare, Health New England and Neighborhood Health Plan. You can view the outline of Plan B below. We would like to thank the labor commissioners for standing strong on this issue from the beginning, and never ceasing to be a voice for our members. Please see footage HERE from the two votes that took place this morning. We will keep you updated as things progress with the votes on Plan Design and Rates. On Tuesday, 10/31, several individuals gave testimony in support of House Bill 1377. Among them were Dori Medeiros, President of Local 458 and Michael Manteria, member of Local 229. As we have discussed previously, each year the Union testifies before the Public Service committee regarding retirement group 4 classification for Associate Probation Officers, Probation Officers and Assistant Chief Probation Officers, asking to be recognized in this group along with our brothers and sisters in other law enforcement/public safety sectors. The hearing is scheduled for 10/31/17 at 1PM at the State House and your appearance and support at the hearing would put the weight of the Commissioner’s office behind our repeated requests to the legislature. Historically, the requests for group 4 classification have had a long path. When we look at other job groups who have been reclassified into group 4, it has sometimes been after a tragedy within their ranks and reactive in nature. The reality is that with increased responsibility for field work and community supervision along with staffing levels that are diminished, the risks for probation officers has also increased. While we have received training to assist us in those situations, the risks remain a reality. We have been fortunate that there has not been any event so egregious as to activate or compel the legislature into approving group 4. I do not want to keep testing that formula. We are respectfully requesting that you join us at the State House, alongside Security Director Jeffrey Morrow, to help us make the case that APOs, POs and ACPOs, along with our brothers and sisters in security, rightfully belong in group 4 of the retirement classification. As a follow up to our recent Comp Time Pay-Out Agreement, we would like to inform those members who chose to participate that the money will be seen in your paycheck dated August 25, 2017. In addition to the Comp Time Agreement, the Union and Trial Court agreed on a few other issues which required resolution. Please click HERE to view a copy of the MOU. Salary Matching for APOs and POs. Employees who are appointed to the position of APO or PO and are already employed by the Judiciary "will be placed at the step and salary closest to, but more than his/her current salary." This provision is retroactive to July 1, 2016. Mutual Respect language has been agreed upon and will be included in our next contract. Seniority for newly appointed COs with no prior continuous service with the Trial Court (example: Associate Court Officers) will have their seniority ranking determined by their class rank in the Academy. The Trial Court and the Union have reached an agreement to pay down a portion of employees’ current comp time. All NAGE members who have accrued more than 75 hours of comp time as of the pay period ending May 27, 2017 are eligible to receive compensation for 25% of that accrued comp time. For example, a NAGE member with 200 comp hours shall receive compensation of 25% of those 200 hours, at their hourly rate of pay. The remaining hours, in this example 150 hours, will remain in the employees' comp time account. This will result in a significant financial pay out at a time when we know our members could use the extra money. Those who do not wish to participate in the pay down will not lose any comp time hours. Any qualified NAGE member who DOES NOT WISH TO PARTICIPATE in the pay down must email Trial Court Director David Bernard at dbernard@nage.org no later than July 15, 2017. Please feel free to reach out with any questions. P.S. Our next Bargaining Session with the Trial Court is scheduled for July 18th. We will keep you updated as the process continues. 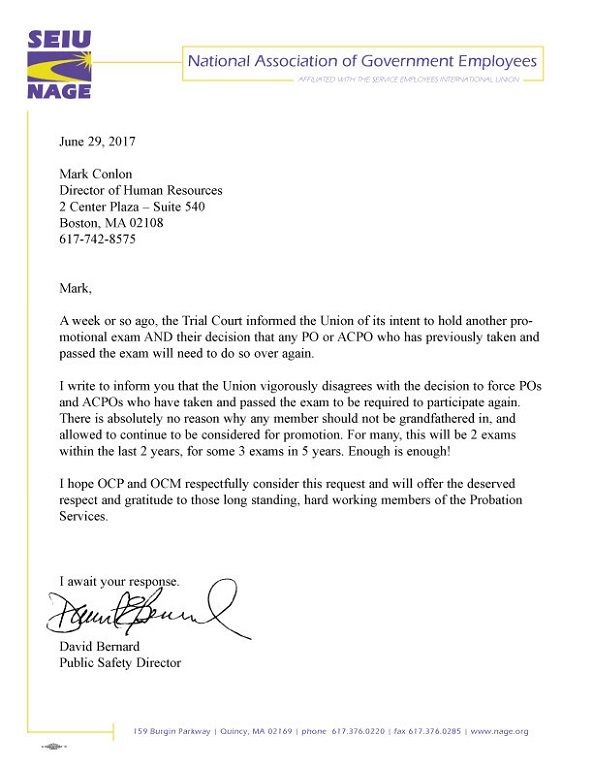 Please see the letter below from Public Safety Director David Bernard to Trial Court Director of Human Resources Mark Conlon. The Union and the Trial Court met for their 5th bargaining session on May 15, 2017. All proposals have been submitted by the Union and the Employer. We have been awaiting updated financial parameters from the Governor’s office, but up to this point the news has not been good. Notwithstanding the exorbitant pay raises the Legislature gave themselves, Judges and Clerks, offers made to the Unions have been very disappointing. We will continue to meet and NAGE is prepared to utilize all resources at its disposal to insure we deliver a fair and proud contract for the Trial Court members we represent. On March 21, 2017, the 3rd session of contract negotiations was held between NAGE and Trial Court Management. Three additional sessions have been scheduled for April, May and June to concentrate the negotiation efforts in order to conclude prior to the June 30th expiration on our current contract. Your elected Board members continue to advocate on your behalf for the best outcome. We will keep you as informed as we are able, and remind you that the particulars of the negotiations are subject to a "gag order" until agreement is reached and it is sent to the membership for ratification. We remain committed to conducting regional informational meetings prior to the ratification vote. NAGE has DOUBLED the number of $500 scholarships from 50 winners to 100 winners. That means you are significantly more likely to win this year. NAGE is committed to helping our members and their families achieve their educational goals and dreams, NAGE is proud to announce the 14th Annual NAGE Scholarships program is now open. This year 100 scholarships in the amount of $500 each will be awarded in a lottery. NAGE has already helped 650 people and donated $325,000 for NAGE scholarships, we believe that YOU should take advantage of this opportunity. Applicants for the lottery drawing scholarships must be planning to attend or already be attending a two- or four-year college, graduate school, trade or technical school to be eligible. Scholarships are available to members of NAGE, IBPO, Trial Court, IBCO, NAGE EMS and IAEP, and the member's spouse, child, grandchild, niece, nephew, or significant other. The application, which is available by clicking the link below, takes about 3 minutes to complete and is the easiest scholarship application you will ever fill out. The deadline to apply is May 20, 2017 but don’t hesitate. Apply today by clicking the link below. Remember, you can easily apply online or you can print out an application and mail it to NAGE Headquarters. As we closed out 2016, NAGE Trial Court reported on a story of a Fall River Probation Officer and the efforts he puts in every holiday season to collect toys and gifts for families in need. This was just a single story of the quiet work that our members do behind the scenes, and off the clock, to better the communities that they live and work in. Another such story is that of Fall River Assistant Chief Probation Officer Mark Costa, who has been working to reunite stolen medals of a late veteran with his family. The medals belonging to Cpl. Frederick Sylvia were stolen shortly before the WWII veteran passed, and it broke his family's heart that he wouldn’t be buried with them. After 18 months of searching, ACPO Costa, along with veteran’s services, was able to track down exact replica of the stole medals to present to Cpl. Sylvia’s family in Florida this week. When asked about why he undertook this mission, ACPO Costa stated, “I see this as an extension of the job we do [for the] Massachusetts Probation Services.” Please click here to see Costa’s interview with WCVB. Also, please click here to see the article in the Boston Globe. The Board of Trustees of NAGE/SEIU Local 5000 Trial Court of Massachusetts Health and Welfare Fund is pleased to announce the implementation of a $2,000.00 Death Benefit. This benefit will be retroactive as of September 1, 2016. The death benefit is available for each eligible employee, spouse and dependent child. A Death Benefit will only be paid for members or dependents who are eligible for Trust Fund benefits at the time of death. A completed Death Benefit Claim Form must be submitted to the Commonwealth of Massachusetts/NAGE Fund Office with a copy of the death certificate. If a copy of the Death Certificate is not included, the claim will not be processed. If you have any questions, please don't hesitate to contact the NAGE Health and Welfare Office. They can be reached by phone at 1-800-641-0700 or via email at fundoffice@nage.org. The Board of Trustees continually strives to improve the Plan of Benefits for Trial Court members. We are proud to take this step forward, as we did last year with the implementation of the Dependent Care Benefit. On December 6, 2016, The Commonwealth of Massachusetts Trial Court held their annual Excellence Awards. Among those honored were representatives from Locals 229 and 458. From Trial Court Local 229, Probation Officer Julie Hall was honored for her swift reactions that saved the life of an infant this past summer. To read more about PO Hall's incredible story, please click here. From Trial Court Local 458, representatives from both the Bellotti Courthouse and Fenton Judicial Center were honored for their dedication to public service, and ensuring the safety of the courthouse. From the Bellotti Courthouse, Local 458 members John Cahill, Paul O'Rourke and Chris Tufo were honored. From the Fenton Judicial Center, Local 458 members Michael Britton, Berlis Cuevan, Carlos Morais and Angel Torres were honored. Please join us in congratulating all that were recognized for their efforts within the Trial Court! It has come to our attention that the use of pencils by panelists on the interview guide scoring sheets during the interview process has continued to randomly occur. We have brought that concern to the attention of Human Resources. They have indicated in response that a directive will be going out to all interviewer panelists that they are required to use pen during the interviews when filling out the guides. Please be aware of this requirement and if you are on an interview and observe the use of anything other than a pen, please alert the interviewer of the requirement and also contact the Union to report the protocol lapse. Seniority lists by job title have been updated as of 5/28/2014. The Assistant Chief Probation Officer and Probation Officer list is available below. Trial Court members are reminded that the Employee Assistance Program (EAP) is available to all Trial Court employees and their families at no cost. While this program is not new, we remind you that it’s a valuable resource if you or a colleague or family member is experiencing difficulties in your work or home life. The program is completely confidential and is described in the brochure that is linked to below. If you or any member has a question about the program, please contact Roger Albrecht, Benefits Manager for the Trial Court at (617) 878-0373, who is managing this benefit.